I finally watched the Gerard Butler Phantom. I say “finally” because I haven’t seen it in…at least eight years. I know this, because I know I haven’t seen it since the first time I saw the stage production. Since the last time I watched this movie, I’ve watched just about every version of Phantom I could find, including the stage production…eight times, actually! The story, of course, is about a masked man who lives under an opera house and falls in love with Christine Daae, the beautiful soprano, who is also pursued by Raoul, the Vicomte de Chagney. The plot is the same as the play, the music is (basically) the same as the play, so I’m not going to get into that here. My interest, as it always is with Webber’s Phantom, was the interpretation. And because this will be long, let’s do sub-headings! I always begin analysis of any version of Phantom (for example) with the most important question. The Phantom. So let’s look at the Gerard Butler Phantom. First, I’m just going to be honest here: he looks really good in the mask. And the green eyes…! 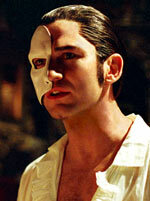 I’ve always said my ideal Phantom looks like Gerard Butler–but sings like Michael Crawford. Because my biggest question with this movie is: why, why did they let Gerry sing? He’s an actor, not a singer, but he was cast as a character who is THE greatest singer ever. Why? There are some very badly delivered lines at the beginning. And then, actually, his singing gets better for most of the movie. But he’s never Crawford (or Karimloo, or Carpenter, or Cudia, or…most of the Webber Phantoms I’ve seen). Which leads us to the unmasking and “Stranger Than You Dreamt It.” Which certainly could have been a pained betrayal but again, it was an angry version. And, while other Phantoms are usually appealing when they tell Christine she can see past his face…this wasn’t an appeal, it was an expectation. I’m sorry that they cut the Phantom’s extra song, “No One Would Listen” (watch it here), because it plays so well into the Phantom’s confidence in Christine: “no one would listen, no one but her.” It’s also one of his better sung songs, features a great shirt (ahem) and also shows his pain in a way that isn’t as evident elsewhere. You would think confidence in Christine would deepen the pain when she chooses Raoul–but again, he’s mostly angry. I’ve seen other Phantoms cover their ears on the rooftop, when Raoul and Christine reprise their love song. Gerry’s Phantom destroys Christine’s rose at that moment. And the rooftop is an especially challenging scene…because it’s ten minutes after the Phantom’s brutal, on-camera, cold-blooded murder of Buquet. It’s all a lot vaguer and shadowy in the play. And this points up a strange set of contrasts–this movie gives us a handsome Phantom with a backstory showing how horribly he was treated as a child…who is more angry and more violent than the stage Phantom. So–is the director trying to make us sympathetic towards him or not? And of course I always am sympathetic, but–this particular version of the character definitely has some…problems as a romantic lead. On to other characters! Christine was very scared (with justification) and very possibly literally under hypnosis. That’s about the only way I can interpret her actions. Which I suppose is a valid portrayal…but it wouldn’t be my preferred one. A scared, hypnotized Christine has no agency; she’s just pushed around (sometimes literally) by the men in her life. Although, points to Emmy Rossum as the first Christine I’ve seen who still had undercurrents of fear during “Point of No Return.” Every other Christine just gets right into the play, which always seemed at odds with all that fear just moments before. My second favorite character is Meg Giry–and she has a much smaller role when I can’t watch her during production numbers! (Because that’s what I do during the play. Sure, Carlotta and the managers are singing, but what is Meg doing in the background? Can’t do that in a movie.) Although I do enjoy the addition of a scene where she tries to investigate the Phantom’s tunnel behind the mirror. Yes. A female character with agency and initiative! The managers, I’m sorry to say, were quite interchangeable as characters (they’re not in the stage play, at least not always), Carlotta was brilliantly over the top, and Piangi struggled to get on his elephant at the beginning, which is really all I ever ask of Piangi. You wouldn’t have to change the costumes to turn a play into a movie. But they did. And every time they had a choice about whether to make something more ridiculous…they did. The movie also felt so much busier than the play. I’m used to the relative minimalism of the stage production. This was giving me sensory overload in spots, with all the crowds of people and the quick cuts between shots. Which, to be fair…is taking advantage of the film medium to do things they can’t do on stage. So even if I got a little overwhelmed, I do respect that choice. All right, if you’ve read this far, you’ve heard all about my…reservations about the movie. To my theory! The movie also adds an element not in the play, by intercutting random shots of Raoul, 50 years later, taking the Phantom’s music box to Christine’s grave. And I was ready to say that those didn’t add anything…until I had a thought. What if the entire rest of the movie is Raoul’s memory? Not what happened–but what he remembers, or imagines from what Christine and others told him. And through that lens…of course the Phantom is angry and dangerous and doesn’t actually sing all that well! 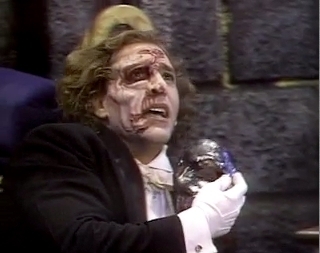 Sure, he’s still handsome, but Raoul knows he’s ugly under the mask, so that’s not that threatening. And perhaps Raoul never bothered to distinguish the two managers, and he wouldn’t be paying attention to Meg, and of course he pictures Christine in her undergarments half the time! (Not just in “Music of the Night” but also on the rooftop, which is really very weird.) Sure, Raoul doesn’t come out well in this story, but I don’t think he actually realizes how inept he looks. Also–Raoul is a patron of the opera, but he’s not an artist; he doesn’t actually understand opera, so he remembers it all as people in funny costumes prancing around a lot. And can’t you just imagine Christine telling her husband for fifty years that yes, she was definitely hypnotized, that’s totally why she was running after the Phantom. It even explains the deleted “No One Would Listen.” The Phantom is alone. There’s no one to tell Raoul about it, so it’s not in the movie. More importantly, the Phantom is so much softer, and more sensitive, and more pained in this scene–because it’s not through Raoul’s lens. You see it, right? It all makes sense. So at the end of the day, I actually enjoyed watching this very much because I’m always fascinated by how someone interprets the Phantom (the character and the story), whether I like how they did it or not. But for everyone else, watch the play live. 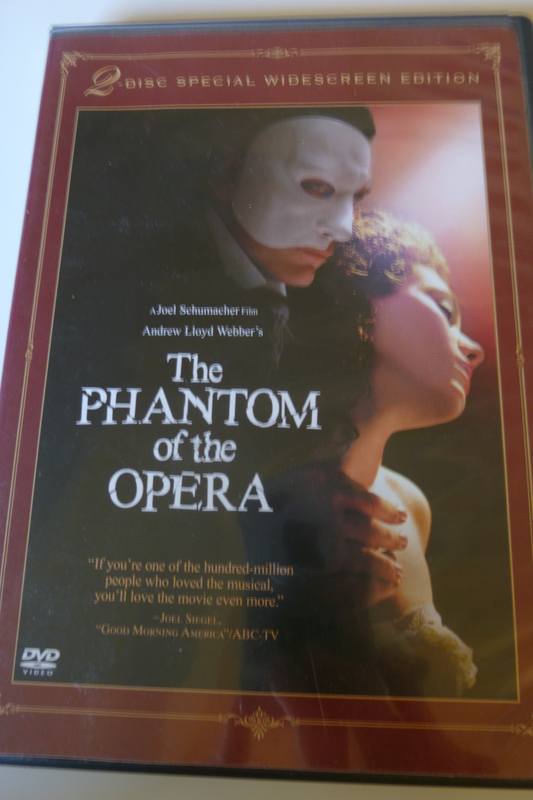 And if you can’t do that, watch the Karimloo Phantom, the filmed version of the stage play. Because that’s a wonderful production, while the movie… Well, Gerry’s Phantom does have wonderful eyes! If you want to see another interpretation of Webber’s Phantom, try to catch the tour that’s currently running (looks like it’s currently camped out in Los Angeles for a while). I went up to Dallas to catch it last year. Same music/dialog, but completely different staging/costumes from the original. Mostly I felt the changes were to the show’s detriment and sometimes even comical, but there were some cool bits. (I’m probably biased, having seen and loved the original first. But I would be interested to know your thoughts about it if you’ve had a chance to see it.) There’s also 100% more lobster. So I actually have tickets already to see the tour when it hits San Francisco in the fall! I definitely missed the detail that it’s new staging…hmm. I’m not sure how I feel about that! But I’m intrigued. I feel like I may have to give a disclaimer to the friends I’m going with though… Oh well, if it’s dreadful I’ll make them watch the 25th anniversary DVD! Should I be worried about this lobster business? It’s new staging for the 25th anniversary, much like what they did with the 25th anniversary tour of Les Mis. There are definitely some cool bits, and if it’s your friends’ first time seeing it, I’m sure they’ll still love it! It’s coming to Houston later this year, too, and I’ll be going back. There’s a GIANT lobster on a platter that they bring out during the feast scene in Don Juan. Thing is huge. I mean… it’s a stage prop, so it’s gotta’ be pretty big for the folks in the back to discern it. But I was sitting close up… haha. Ah, okay…I’m relieved it isn’t a lobster costume at the masquerade, or something equally terrifying! !